Easy to clip in & out. The platforms give a better feel than just the eggbeaters. Solid design even with the light weight and they still look great. I have used these for a year and they are still going strong. A big increase in $$$ from candy-1, but BTD offers a very competitive price on these. I would not recommend using regular shoes at any time with these pedals. If you're using on a commuter, look at shimano dual-platform. if crank bros starts to make a dual-platform, i'll be the first to consider !! I ride 2,000 milesyear for pleasure, health, endorphins and fresh air. Got to have good pedals. Crank Bros. Candy 3 are my favorite for durability and maintenance. The platforms are nice to have when jumping on the pedal when the light turns green. BikeTiresDirect has good price, flawless service. Thanks for that! Spend more time riding, whew, who! 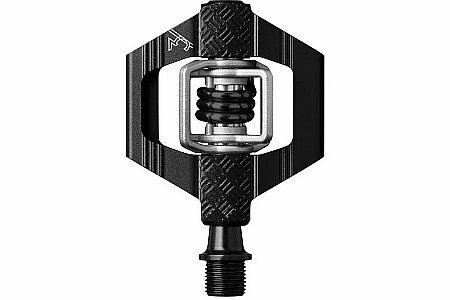 Have always loved the pedals, work great for cyclocross, BTD had these pedals [$] below anyone else highly recommended! !